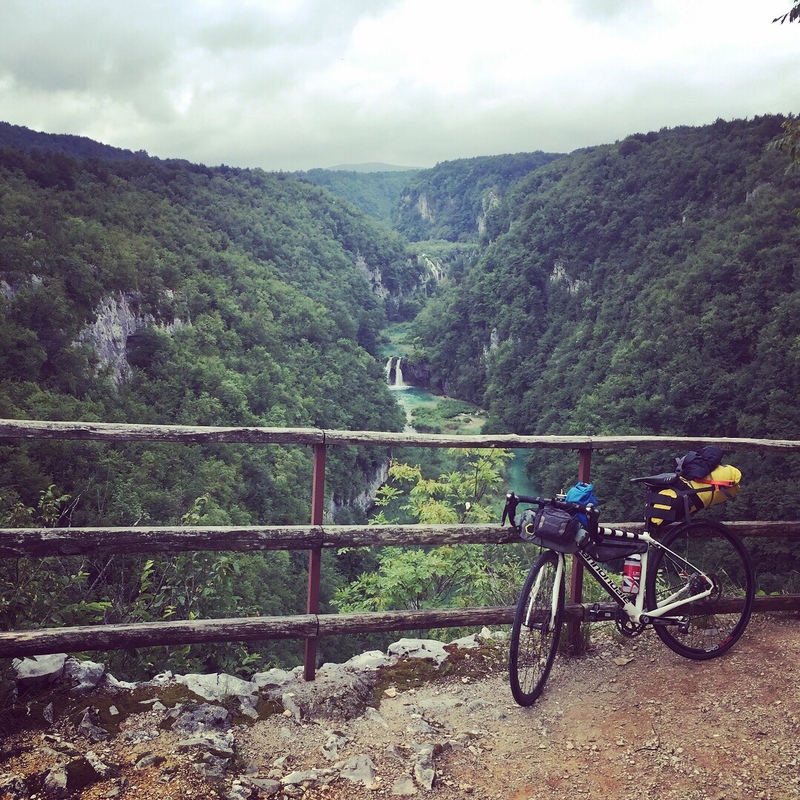 I’d cycled from Senj on the coast inland to visit Plitvice National Park, and it was SO worth it. It was a welcomed break moving away from the coastline, as with it came dense forest and lots of shade. At times the wind really sent me sideways as I meandered up and down towards the Bosnia and Herzegovina border. The road was quite busy, tourist central I guess and peak season so I should have known it. No matter how much I ride, sometimes I just can’t handle all the cars, motorbikes and trucks that whizz last me…especially when I am going uphill and they don’t give me much space. This got me thinking of an idea for cycling clothing. A jersey or backpack with huge text on the back saying, ‘give me space,’ or, ‘BACK OFF.’ Probably not unique and probably done before. It also got me thinking imagine if you’re bike or car had sensors on the side, so that if a car didn’t give you at least a meter space, a warning sign or siren goes off. Would be pretty funny and definitely help both cyclist and driver! For all those drivers out there reading this (which would be most of you), when you’re driving past a cyclist please just do 1 thing, give them as much space as you can and SLOW DOWN! After all, YOU are much more protected and able to break than me. Thanks. Arriving at Plitvice National Park, once again, I saw bear sign warnings and was trying my best to spot one! The park is beautiful, so vast and lush with vegetation. I got my ticket and left my bike by the entrance. Walking into the park and onto the boat across the bay, I was struck by how green the water was. Thinking the boat ride was the trip I started taking pictures of the water and fish, seeing some waterfalls across the distance. I didn’t know the boat ride was just was just a few minutes long followed by an hour hike visiting countless waterfalls high and low! It really looks like avatar – so avatar does exist! The beauty is unreal, takes your breath away. I wondered why you weren’t allowed to swim and soon realised that it’s to keep it as untouched as possible. They’ve done a fantastic job at keeping it natural and as untouched as they can. Makes you feel like you’re walking through waterfalls, the forest and peering into the see-through lakes (literally!). If you go, go first thing. It was busy but at least I had a fairly peaceful walk compared to peak hours. I’d left Plitvice National Park and headed back for the coastline, stopping off in a small town called Pursic the night of the World Cup final, Croatia against France! I cycled through town after town with empty houses, some shells and some torn down. One town called Bunic just had some wild turkeys roaming around! It seems a lot of places have just been deserted during the war perhaps. The final was fantastic to watch in Croatia. I found the only place in town open, a restaurant called the Albatross and enjoyed some pizza and beer whilst watching the game with all the locals. Despite the loss, the locals were so respectful of France and were still so pleased that they were even in the final, we could all learn a thing or two from the way the Croats enjoy football! Leaving Pursic I headed towards Zadar on the coast. I had planned to stay a little outside of Zadar, but when I cycled through, again it seemed desolate town after desolate town. I decided to keep on going all the way to Zadar as I’d have more choice of beds! Despite a blisteringly hot day and a seriously long ride, I was thankful to be in a big place by sunset. I stayed in the boutique hostel in the old town and it was literally like a boutique, well worth the £20! That’s where I met Marko and Ian, two Croatians from Istria who were touring Croatia by bike for a week. It was so great to meet other cyclists and after bumping into them a few times whilst visiting a bit of Zadar (including the Sea Organ, just wow! ), I decided I scrap my plans and ride with them on Dugi Otok island for the day. We took the boat from Zadar to Sali and set off for the highest point on the cliffs. It was bliss to ride with almost no cars, cyclists or people and really take in the views, like the salt lake. Marko asked me about my bike and if I’d ever had any problems since I left Holland, like flats etc. I said thankfully not and he couldn’t believe it. We joked that my time would come very soon and then hisssss that flat tyre sound on my front, as if! Marko changed it in about 10 mins flat and we were back on our way, thanks Marko! Afterwards we had dinner in Zadar and said our goodbyes. I feel I’ve made life long cyclist friends and hope to see Marko and Ian again someday! My last few days riding on week 5 were first to the beautiful Sibenik, a small town on the coast with a lot of Venetian and renaissance charm to it. The following day I headed for Skradin more inland as I wanted to visit another national park, Krka, with again more waterfalls but this one you can swim in! I decided to sleep the night in Skradin so that I could get to the park at 8am for when it opened as I’d heard the crowds get unbearable. Arriving in Skradin I treated myself to my first massage of the trip and it was such a treat, getting rid of lots of nots and resetting my body and mind! Love to read about your amazing adventure and to see the stunning sceneries you have so far been blessed to have enjoyed!